To wash Snoopy, a Sheepdog (about 18 kg) the abundant fur, I pour a few drops of essential oil of citronella Java, géranium rosat and true Lavender in 100 ml of a good canine shampoo. This preparation, diluted in a large volume of warm water for easier application, smells deliciously good. Another option: essential Mint pouliot and eucalyptus oil. 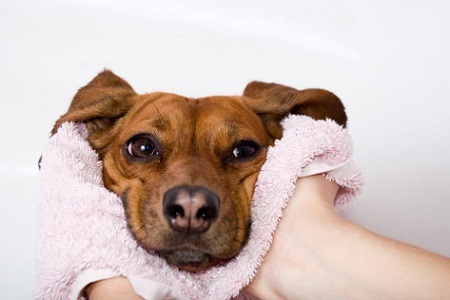 For good efficiency, run warm water in the tub so that the dog’s paws bathe much. Start by wetting your pet on the neck to avoid fleas jump on his head. Shampoo completely and rinse it coarsely. Apply the shampoo again by well penetrate into the hair. Let it rest for 5 minutes (or less if your friend gets impatient). Meanwhile, you can comb the coat and Walnut chips seeking to escape. Rinse with a mixture of vinegar and water (2 tablespoons of vinegar in 1 litre of water) to eliminate the last residues of SOAP and shine the fur. Cut 2 lemons sliced and on it pour 1 litre of boiling water. Let them soak overnight, then press them into the water from the container. Vigorously rub the dog with this lotion. You can prepare a more concentrated version by adding the fresh juice of 2 lemons in the prepared lotion. In Provence, summer, I picked a few sprigs of Rosemary as I soaked in 1.5 liter of boiling water until cool. At the end of the bath, I imbued the fur with a spray. Extra bonus: the application of this recipe makes the hair soft and shiny. Pour 4 tablespoons of cider in a spray bottle of 200 ml vinegar, a few drops of essential oils of lavender and Mint. Fill the steamer with water source and shake well before use. Avoid the eye area when spraying. Herbal Mugwort, Pennyroyal, marjoram and Rosemary. You can also add the santolina and Chamomile, two plants that fleas flee like the plague. Well divide the powder over the entire body focusing on the parties without hair.